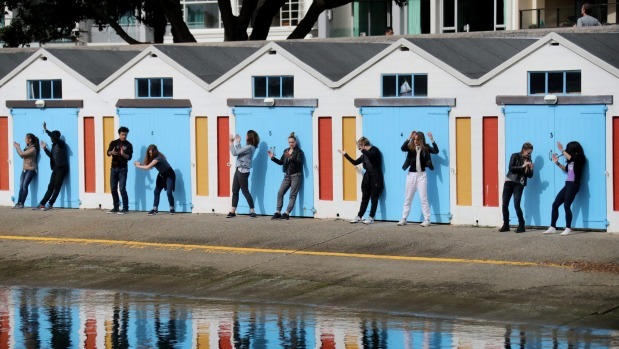 Dancing in the streets of Wellington, or on board a moving cable car, is a little different from the Royal New Zealand Ballet’s usual stages. as part of a short film for their upcoming production Three By Ekman. Oriental Bay, Civic Squre, the Botanic Gardens and the cable car were among the sites the dancers performed at. Spanish choreographer Fernando Troya was chosen by Ekman to teach the dance. Troya says since Ekman created Episode 31 in 2011, the work has been performed around the world, and each time a new short film has been created. Reactions from the public were mixed, with lots of laughs but also people avoiding the dancers. Abigail Boyle, a member of the RNZB since 2005, says she is enjoying this season, as Ekman’s works are quirky, requiring dancers to use their brains as well as their bodies. The dancers learned Episode 31 in 10 days, but Boyle says that’s plenty of time. Their Three By Ekman production also features Tuplet and Cacti. Troya says Ekman is very good at providing entertainment for the audience. “They will laugh, they will enjoy, they will not be bored. They will enjoy the light, the dance, the costumes,” he says. “His style, I guess it’s a little bit crazy. It’s quite sharp, quite funny, quite dry. * The RNZB premieres Three By Ekman at St James Theatre from May 17-20 before touring to Auckland, Napier, Christchurch and Dunedin. Tickets from Ticketek.